Please remember that the order these are presented in here is not an indication of the order in which they should be watched. You can view them in any order. Some are linked to from other pages on this site, but some only appear here (those marked with [**]). Supplementary readings and links are suggested for those; the remainder have those links on other pages. By the end of the course distance learners should have watched all the Prezicasts. Please also read the explanatory technical notes at the end of this page (after the list of movies). Problem-Based learning. The online Prezicast is available here. This Prezicast is linked to one of the course activities and can also be seen on that page. For supplementary reading, just start with this page and follow up some of the other references thereon. The list of types of problems that I refer to in the Prezicast is from Jonassen, D., Howland, J., Moore, J. and Marra, R. (2003) Learning to Solve Problems with Technology: A Constructivist Perspective, London, Merrill. The triadic model. There are three interlinked Prezicasts, on the Objective; Subjective; and Intersubjective sides of the triad. For supplementary information, go to the set of pages on the triadic model. Environmental literacy [**]. You should look at this Prezicast after having familiarised yourself with at least the basics of the triadic model. The online version is available here. I haven’t provided any supplementary information about the notion of ‘environmental literacy’ itself, but try St Clair’s contribution to Hull et al (see the main reading list). Critical media analysis. The online Prezicast is available here. This connects with a course activity: there is plenty of supplementary information on that page. Information behaviour [**]. I’ve finished this Prezicast now: it’s available here. The literature review mentioned therein by Saracevic is most easily retrieved via this Google Scholar search: it comes in three parts, and all of them are worth reading, in the end. Donald Case’s book, Looking for Information, is available from the JRUL as an e-book. 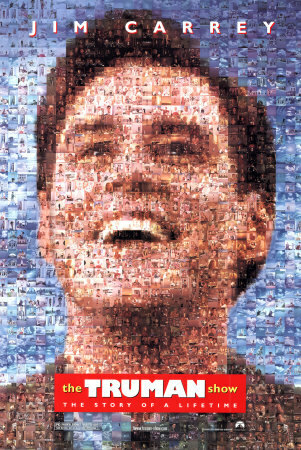 Poster for ‘The Truman Show’: another good film about the way the media affect our lives. Incidentally this poster is also notable, being the first one to use this ‘collage’ effect of thousands of small images to produce the main one. Have a look at the video about Deansgate library. Supersize Me is embedded into one of the course activities – read the notes and then view it from that page. 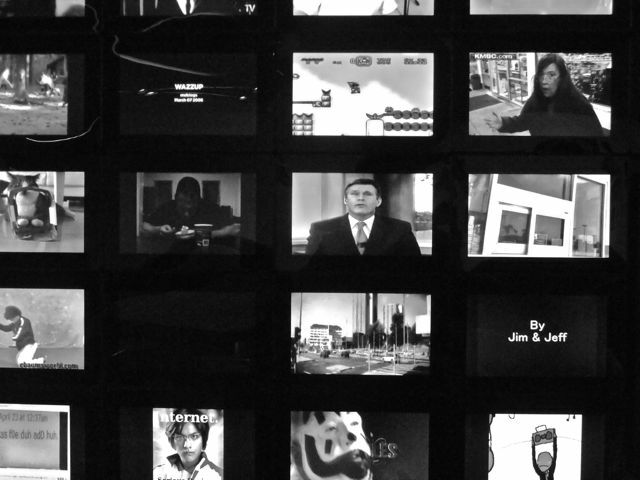 Two clips from Broadcast News are embedded into the activity on critical media analysis. This is quite a good film in general, and does have things to say about the news media, though it’s more interested in the romantic lives of the characters than their working ones for most of its length. The Truman Show (poster on left), though it takes about half an hour to get going, is a brilliant investigation of the way that, quoting a character in the film, ‘We accept the reality of the world with which we’re presented’. In the light of the developments in ‘reality TV’ over the last few years, it is very prophetic. Network is a 1970s satire on the TV industry; a newsreader suffering a nervous breakdown is turned into entertainment by executives desperate for ratings. It’s over-the-top but makes its point well enough. The Prezicasts were created as an experiment a couple of years ago. In technical terms they are Prezis (see http://prezi.com) with an audio commentary overlaid, and, at some points, video materials (mainly of a ‘talking head’ – mine, specifically). In teaching terms they are basically short, 10- to 15-minute lectures with accompanying visual material. Prezis can be viewed online or off. It is probably most convenient to watch them offline, as apart from this meaning they can be viewed any time, regardless of connectivity, when viewed offline they also ‘autoplay’ properly. Viewed online, you need to keep pressing the ‘next’ button (or use the arrow keys) when the commentary comes to a stop. To view them offline you will need to download the relevant zipped folder from the course Dropbox. (Everyone registered on the course will receive an invite to the Dropbox by e-mail at the start of the course: this e-mail will contain all the necessary information here.) Once downloaded you will need to extract the contents of the zipped folder and then open the file called ‘Click Me’. Viewed online, you need to keep pressing the ‘next’ button (or use the arrow keys) when the commentary comes to a stop. If you are viewing online, you can click on the ‘more’ button to enable a full-screen view. And please, if the Prezicasts aren’t working: tell me – better still, tell Marilena (marilena_aspioti@yahoo.co.uk). We need to know if things aren’t working as they should.